Like the name El Primero (meaning ‘first’ in Spanish) suggests, it has continued to lay standards for other modern-day mechanized wrist watch brands, even though it has been in the market since the ’60s. Some of its features include its measurement of time for as low as one-tenth of a second and beating at 36,000 vibrations per hour. Zenith Defy is an ultra-high-frequency line of watches with 1/100th of a second chronograph. Defy series simply looks and feels modern in all aspects with a ceramic case, titanium double folding clasp and black alligator leather coating strap. Chronomaster is a classic series that depicts originality. It has many models with ceramic and stainless steel casings and alligator leather straps. Chronomaster comes with legendary El Primero automatic movement. Elite series is focused on elegance and has automatic elite calibre movement beating at 28,800 VpH. Other features include 50 minutes’ power backup, water resistance, stainless steel case and leather strap. 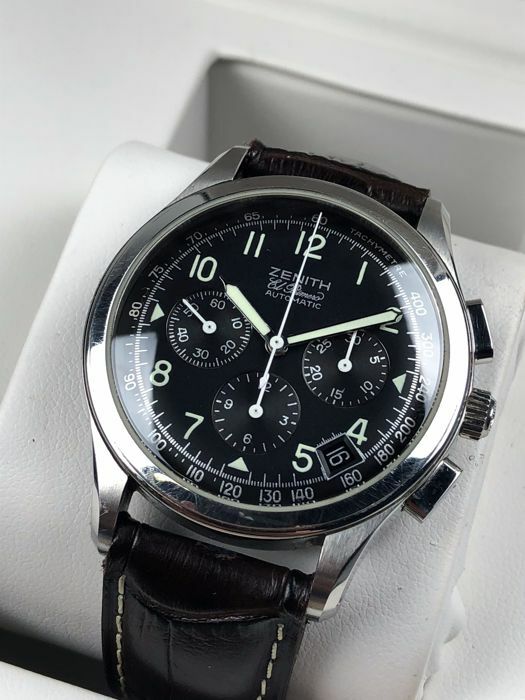 Zenith Pilot series ties with aviation and has El Primero and elite automatic movements (model dependent). The Pilot series case made from bronze material and has oily nubuck leather straps other than waterproofing.